A review of Western Health Insurance Company finds Western Health Advantage. Based in Sacramento, California, Western Health Advantage is a relatively young insurance company. It was started approximately twelve years ago to help local business owners meet their employee’s health insurance needs. Health insurance rates are right at your fingertips. Just put your zip code into the free box on this page and you’ll be shopping for health insurance in no time! Western Health Advantage’s commitment to these is evidenced in its high number of satisfied members. The company also has a 24-hour Nurse Advice phone number in case you have questions about medical conditions or procedures, or need other pertinent medical advice. You can reach a registered nurse at this phone number any time of the day or night: 1-877-793-3655. Enrollees in Western Health Advantage’s medical coverage plan must choose a Primary Care Physician (PCP) from the company’s provider network upon enrollment in their plan. PCPs must also be chosen for any family member participating in the plan. These primary doctors will provide the plan members with their routine medical care, including shots and check-ups. If the member needs to see a specialist, they will need to get a referral from their current PCP and will need to make sure that the specialist is in Western Health’s network in order to receive full coverage. If you need to see a specialist who is out of network, you must get pre-approval in order for the visit(s) to be paid for by Western Health Advantage. The exception to this is that members may pick their own participating provider for their routine gynecological visits, as well as their eye exams. If you’re interested in potential positions that may open up with the company, you can click on the “Careers” tab of its website and follow the directions for applying for a job with the company. Western Health Advantage has received a financial strength rating of “B+” from A.M. Best Company, one of the most-recognized ratings companies in the insurance industry. This rating is a “Good” grade, as is its issuer credit rating of “bbb-.” The company has a stable outlook from A.M. Best. 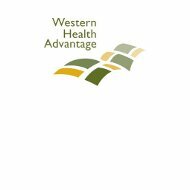 Although the Better Business Bureau does not accredit it, Western Health Advantage currently enjoys a grade of “A+” from the agency. This is partly because of the length of time the HMO has been in business, along with the low number of complaints filed against it. In the last 36 months, there was only one consumer complaint filed with the BBB having to do with Western Health’s products or services, and that was resolved successfully. While Western Health Advantages says that customer satisfaction is a primary concern of the company, it has only received a “three-star” rating from its members in the 2011 edition of the California Office of the Patient Advocate’s Healthcare Quality Report Card. Last year, the company enjoyed a “four-star” rating. If you’d like to research healthcare insurance and coverage providers in the California area, you should check out the California Department of Managed Healthcare. A search of the Internet also yielded some customer complaints about the company. The company does openly provide a form to submit customer grievances on its website, so that it can address them and to its best to resolve any problems its services or products. If you don’t live in the California counties that Western Health Advantage serves, we can still help you find quality health insurance quotes! Just input your zip code into the box below.